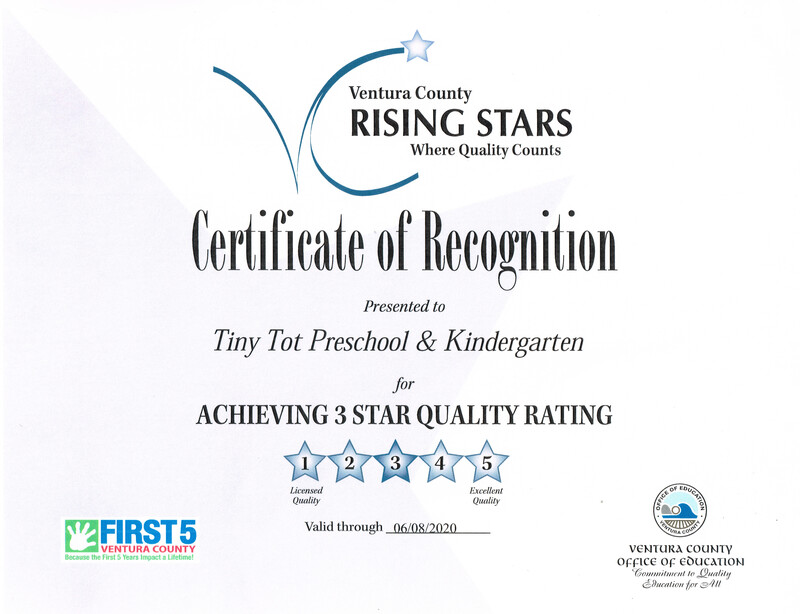 Tiny Tot Preschool & Kindergarten is part of the Ventura County Rising Star Program. We are so proud of our staff and administration for all the hard work achieving this honor. Rising Stars is an easy to follow 5-star rating and continuous quality improvement support for early learning programs which makes it easy for parents to identify quality providers while giving providers the opportunity to promote their programs with Rising Stars validation. Parents, teachers, child care providers, policymakers, and the general public realize more than ever that a child’s early years are the most critical for establishing a foundation for learning. With thousands of Ventura County’s children in out-of-home care every day, the quality of that care is vitally important as it impacts a child’s readiness for school. For this reason, one of the most important decisions a family will ever make is choosing the right early learning environment. Early learning sites, including center-based and family child care, participating in Rising Stars are rated on a scale of 1-5 with 5 as the highest quality. The tier rating is determined by a calculation of several elements of quality, such as ratios and group size, teacher-child interactions, teacher qualifications, the appropriateness of the environment and developmental assessments and screenings. This entry was posted in Events, Information, News and tagged affordable child care simi valley, Child Care, Day Care, Day Care Simi Valley, Director Tiny Tot Preschool & Kindergarten, Preschool, Rising Stars, Rising Stars Ventura County, School Near Me, Simi Valley best school, Simi Valley Kindergarten, toddler care, ttpk. Bookmark the permalink.